I’ve seen that question posed again and again in early coverage of Google’s new high-end Pixelbook. It may sound like a dig – and I’m sure some intend it as such – but there’s an element of genuine curiousity there, as well. Techies can’t figure out why exactly someone would want an expensive version of something that is intentionally limited in its capabilities as a workstation. I’ve been among those ranks, but after asking members of the Pixelbook and Chrome teams and brainstorming with my co-workers to no avail, I found the answer closer to home. My grandmother is in her eighties and is learning to love tech. It all started with a fourth-gen iPad. When she’d mastered that (in the humblest sense of the word) — she moved on to an Alcatel Idol 4. Now she wants a laptop. I’ll admit, I’m a little hesitant. She may enjoy using tech, but she already gets into enough trouble with her mobile devices. I’m just not sure I want to troubleshoot a laptop running macOS or Windows. 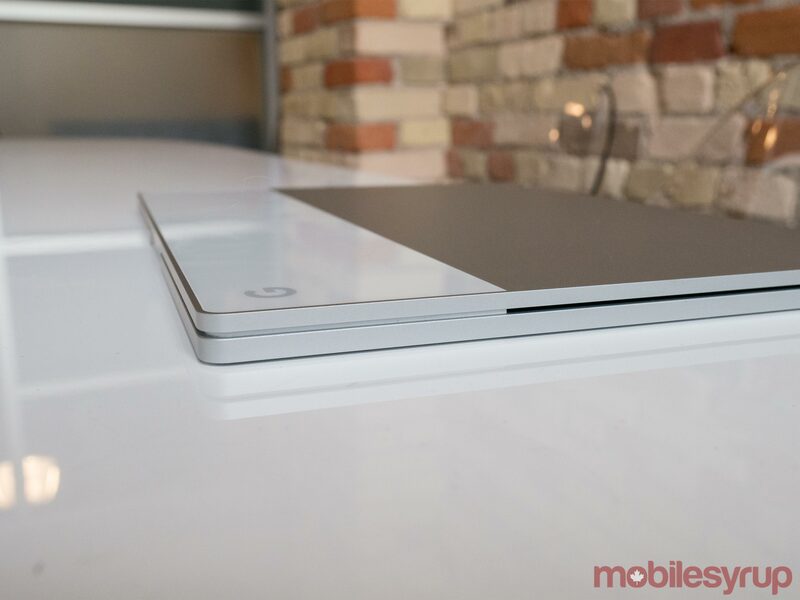 This is where the Pixelbook starts looking really good. She’d be familiar with the apps and the concept of how to install them and the keyboard would be much easier for her to navigate than on her mobile devices. 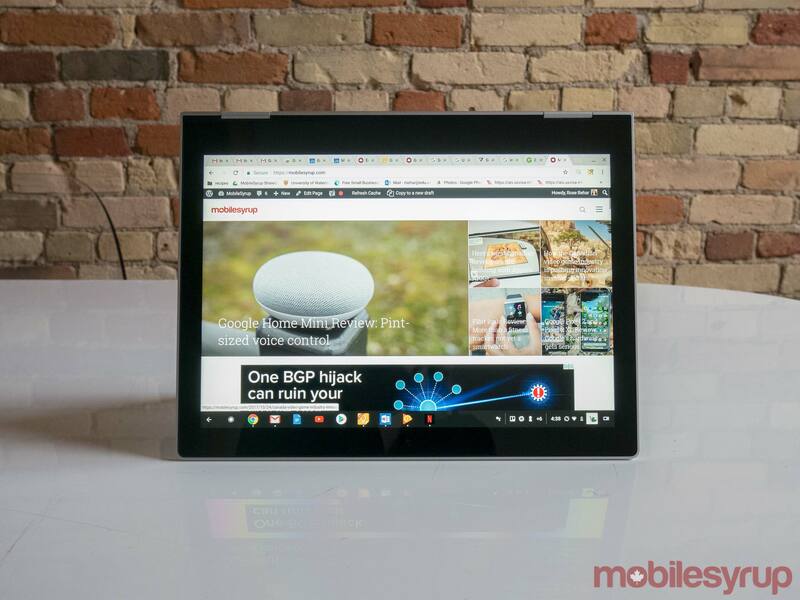 The only real downside is the price, but starting at $1,299 CAD, it’s a significant one. 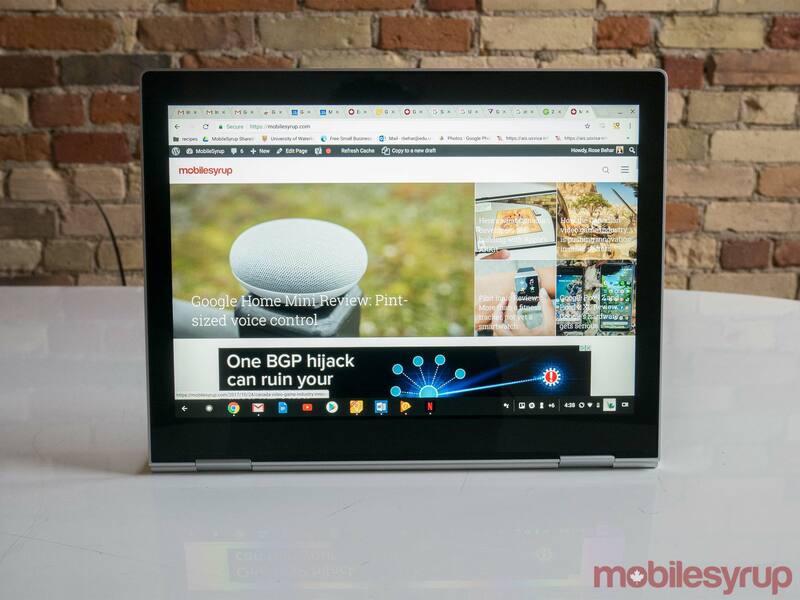 I don’t think the price is necessarily a hard-stop for every potential buyer, however, and while I’m aware there are other, less-expensive Chromebooks on the market that might be better suited to our particular situation, I also think there are consumers that will pay a premium for a marriage between excellent performance and complete simplicity. The person the Pixelbook doesn’t work for, it turns out, is me. Like most tech reviewers, I need to edit photos and video on my machine and the Pixelbook stops just short of giving me what I need in that respect. For instance, I can use Adobe Lightroom to edit RAW photos, but I can’t use it to size them properly. In any case, in this review I’ve attempted to put this issue into its appropriate context. It may be frustrating for me, but for many it’s not an issue. The essential questions are: does this 2-in-1 do what it sets out to do? And is it worth the price tag? The second we’ll leave to the end of the review, but let’s dive into the first question. In many respects, the 2-in-1 succeeds in the construct of these guidelines. The Pixelbook’s design is one of its strongest elements – but there are a few quirks. To start with an immediately apparent one: the bezels around the screen are quite chunky, at a time when competitors are striving to reduce. In a practical sense, it’s not a huge detractor, but it makes the display look smaller and certainly detracts from overall appearance. Another minor detractor is the fact that there are only two USB-C ports on the device. It’s the way of the future, but for many the lack of USB 3.0 is likely to cause some difficulties. It does feature a bonus 3.5mm headphone jack on the left-hand side of the base, however, which allows users to avoid the dongle life or purchasing wireless headphones if they’d rather put off the inevitable. Also on the left-hand side is a volume rocker and a button for locking the screen. 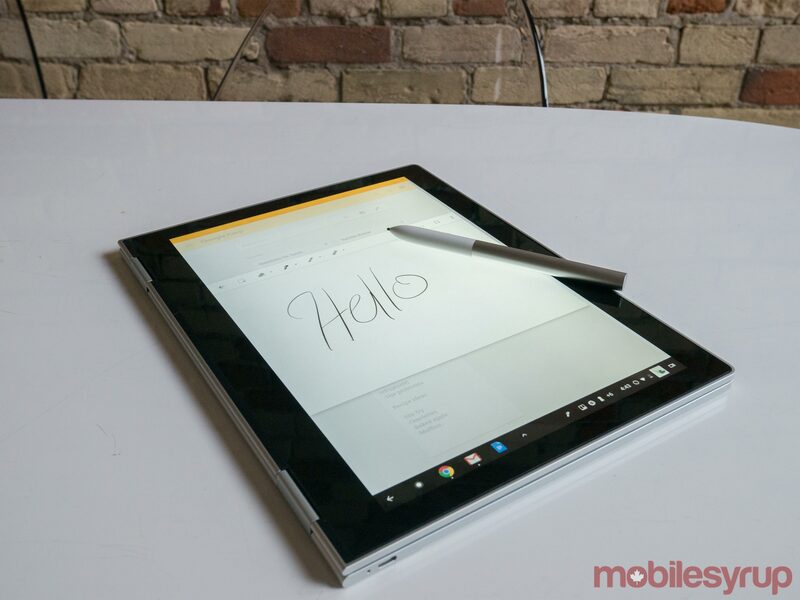 Delving into more of the good stuff: the little 2-in-1 feels exceedingly small and light. In reality, it doesn’t win the featherweight crown at just under 2.5 pounds — the MacBook Air and 12-inch MacBook weigh in at around 2 pounds. However, that’s still lighter than many competitors, including the Surface Laptop and Lenovo Ideapad 710S. Meanwhile, its thinner than all the above listed competitors, making it extremely easy to slip into an over-stuffed backpack. 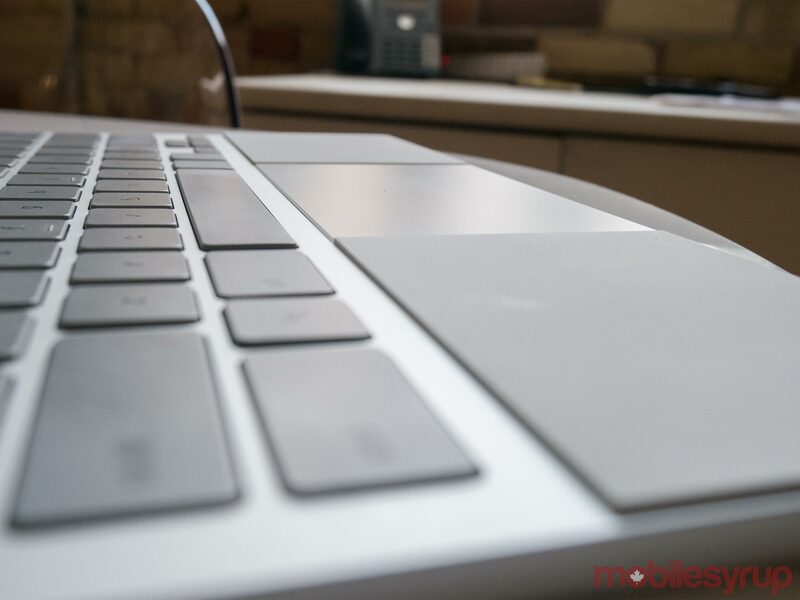 I also found the trackpad was exceptionally smooth and responsive, and enjoyed the ease of using the Pixelbook’s dedicated keys for bringing up the system menu, Google Assistant and Google search. The lack of cushion on the keys (0.8mm of travel) was unpleasant for long-term typing projects, however, and I felt somewhat constricted by the small size of the keyboard. On the flip side (literally), I was very impressed by Google’s small and unobtrusive 360-degree hinge, which moved smoothly when rotated, but also remained solidly locked in any given position. To my mind, this is the perfect form factor for a 2-in-1, giving it a flexibility that most of Microsoft’s Surface creations fail to achieve. In fact, pitting the Pixelbook against the similarly priced and positioned Surface Laptop, I’d have to say I prefer the Pixelbook’s design. It’s not necessarily prettier – the Surface Laptop’s sleek exterior, classy collegiate colour options and Alacantara fabric come together to make a very handsome laptop – but it does have more flexibility of form. Additionally, the Pixelbook’s silicone palm rests which rest on either side of the glass trackpad offer the same warm-to-the-touch benefits that the Alacantara fabric does, and may be easier to clean. Having said that, after several days of use they’re far from the pristine pads they once were. Most noticeably, a grease stain has marred one side. The palm rests aim to provide other benefits, too. They’re raised high enough that they should keep the keyboard from pressing into the screen and making dust marks when the laptop is closed — unfortunately, in practice you still end up seeing those imprints. 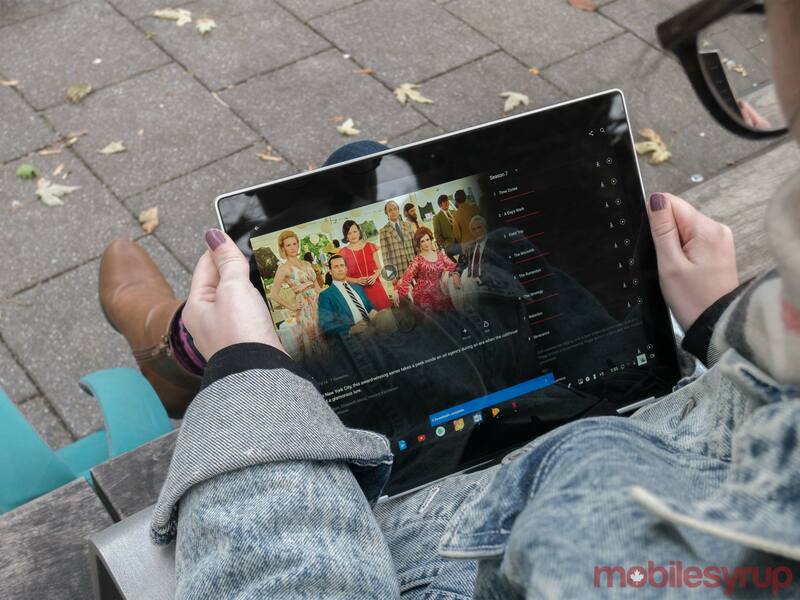 They do, however, provide a secure surface for when the Pixelbook is in ‘entertainment mode’ – i.e. when the keyboard is folded underneath as a base and the screen faces up. In terms of other configurations, there’s the aptly named ‘tent mode,’ and of course ‘tablet mode’ in addition to the standard laptop setup. While I didn’t find much need for using tent or entertainment mode (though they’d clearly be useful in the tight confines of a plane), I occasionally used tablet mode, either for viewing video, reading or taking notes with the Pen – sold separately for $129 — during a meeting, and the switch between modes was seamless and quick. At this point, I should note the performance of the Pen with the Pixelbook — which was created by Wacom – showed more lag than I had expected, and even caused one of the more significant slow-downs I experienced with the Pixelbook. Google says this is a known issue and states a fix is expected to release by October 31st. For the most part, though, it was more than adequate for jotting down notes and casual sketching, and I enjoyed the fact that it doesn’t require any fussy Bluetooth pairing. My main gripe is the fact that it doesn’t come packaged with the Pixelbook, even at the laptop’s premium price point. While bezels were my main issue when it came to design, what they contain is a pleasant, if slightly yellow-toned, display. As is the case with the Pixel 2, the display offers vibrant colours, but with a warmth that goes just slightly overboard. It’s quite bright, however, and seemed to outshine, by a small margin, the 2016 Surface Book I usually use to work. All this made for a solid streaming device, and content on Netflix expanded to the full size of the display, making the most of the not exceptionally large real estate. As for internals, my device – the base model – stocks a seventh-generation Intel Core i5 processor, 8GB of RAM and 128GB of SSD, which paired with Google’s operating system led to a buttery smooth experience. It consistently zipped along even with multiple productivity apps open and many tabs running in my browser. During my time with it I only experienced two minor instances of lag. 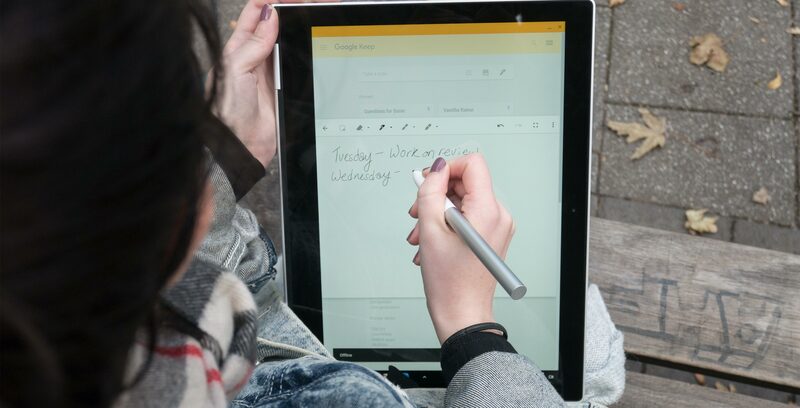 The first occurred when using the pen in the Google Keep app, and the second while writing in Microsoft Word. Other than that, the experience was fantastic — though I think if the Pixelbook offered the ability to use more processing-intensive apps, performance would begin to suffer. One of the highlights of the Pixelbook, for me, was battery life — a benefit of having a limited operating system. The 2-in-1 was able to last me almost an entire eight to nine-hour work day, though I switched to my Surface Book when I needed to edit photos. Still, with almost constant use for word processing, browsing and using productivity apps (and the display two notches away from full brightness) I was able to work from 9:30am to 5pm without plugging in for a charge. Once it was out of charge, the fast charging 45W charger was able to bring it back up to full at an impressive speed – about 60 percent in just over 40 minutes, for instance. 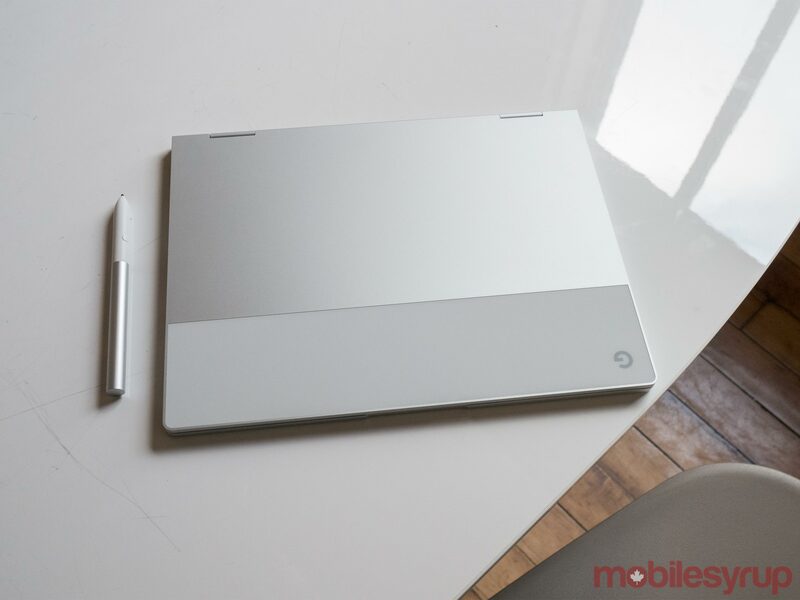 But while long-lasting battery is a wonderful advantage for a mobile device like this, it doesn’t mean much if you aren’t able to complete essential tasks — so lets dive into the software and what you can and cannot do on the Pixelbook. You can operate any Android app on the Pixelbook — a feature that’s been in beta for quite a while — but that doesn’t mean that all those apps are optimized for the device. Some appear so stretched in full-screen mode that they’re confusing to read and navigate. Images shared in Slack, for instance, show up in the feed as enormous blocks that take up almost the entire window. This is somewhat curious considering that Slack, like Adobe Lightroom, Netflix and VLC, worked with Google on optimization. But the explanation may be that Google doesn’t see full-screen as a normal use case for Slack. Lui noted that for messaging platforms, a window roughly the size of a smartphone display, which can overlap other screen content but not fully obscure it, makes sense for multi-tasking. Speaking of multi-tasking — in desktop mode, switching between multiple apps was pretty easy. Android apps can be dynamically resized like any other window, though not all can be snapped to the side by long-pressing on the ‘maximize’ icon as Chrome tabs can. For example: Google Keep could, but Slack could not. In tablet mode, unfortunately, you cannot resize windows — though in practical terms there’s likely not many times when you would need that capability and couldn’t just shift back to desktop mode. Another marquee feature is Google Assistant. 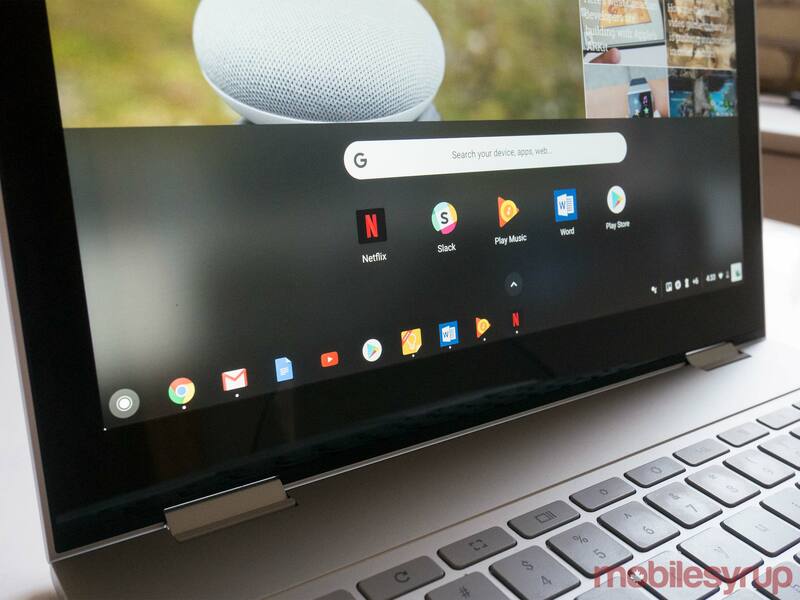 The Pixelbook is the first laptop to have it built-in, and there are three ways to take advantage of what is arguably the best personal assistant on the market: say “Ok Google,” press the dedicated Assistant key or hold down a button on the Pen. This allows you to circle something of interest on the screen in order to get more information or perform certain actions. The most useful example of this is receiving an email with event details and circling it to create a calendar event. It wasn’t perfect — you still had to tweak certain details before adding the event to your calendar — but it was a handy head-start. The Pixelbook’s answer to easy unlocking is also a software-based feature. 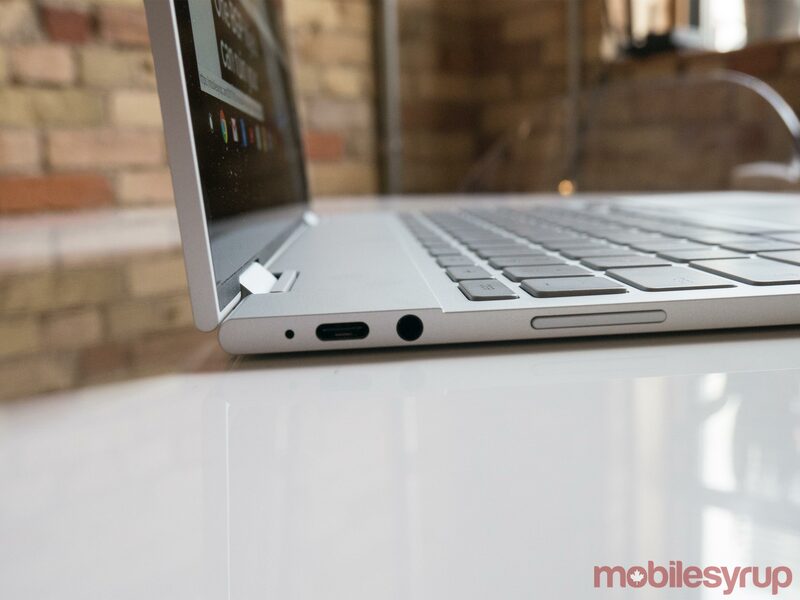 The laptop uses ‘Smart Unlock,’ an existing feature of Android, to let users unlock their Pixelbook by unlocking their smartphone. In testing this out, I found it worked with the Pixel 2 XL seamlessly, but I wasn’t able to get the Sony Xperia XZ1 to connect — I’ve reached out to Google for more information on this. 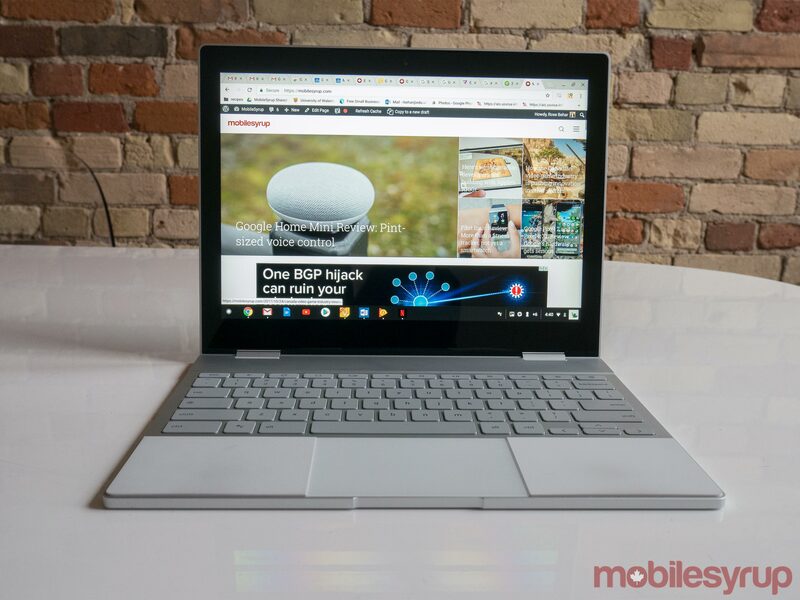 Another touted feature is ‘Instant Tethering,’ which lets Pixelbook users move seamlessly to a hotspot connection from their phone if they lose Wi-Fi. I wasn’t able to test this, as the feature wasn’t quite ready yet. Google says an update will go out on or before October 31st, along with improvements to assistant set-up and Pen latency. 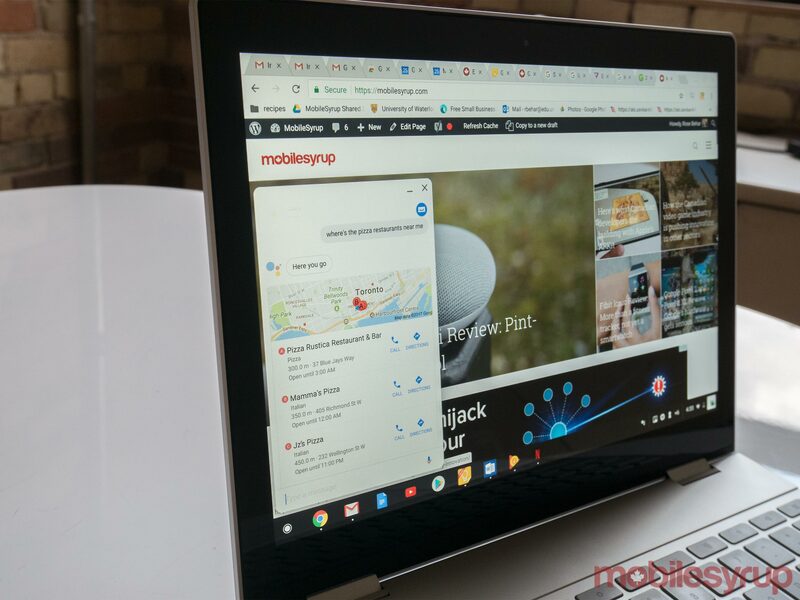 The company says the ability for the laptop to recognize the ‘Ok Google’ command while the display is off is also coming soon. All in, I really enjoyed my experience with Chrome OS and desktop Android apps, but I wouldn’t say it operates as a workstation. In fact, even calling the Chromebook a productivity device is pushing it. The lack of processing-intensive photo and video editing apps makes it a difficult sell for professional creatives. Meanwhile, coders will most likely stay away because many tools and software development kits won’t run on webpage-based integrated development environments. 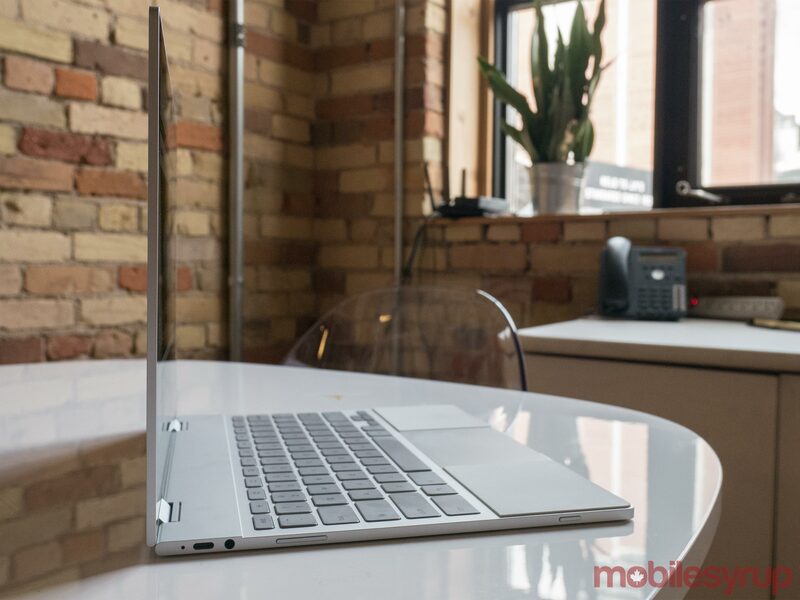 The Pixelbook is for those with light computing needs, who desire a well-designed, easy-to-use and lightweight laptop. That lines up perfectly with the company's stated intentions, which satisfies the first essential question I posed, but the second -- is it worth the price? -- is more difficult to answer. $1,299 CAD (plus $129 for the Pen) is not a small amount of money. At this pricing level, Google puts itself in competition with laptops that undeniably offer more, especially when it comes to software. But is more always better? Not in all cases. Sometimes it's best to give your audience just what they need and nothing superfluous. I think overall, the Pixelbook makes a strong argument for the 'less is more' approach. It's snappy, well-designed and features a simple user interface that's not likely to confuse, while still providing a vast array of applications by virtue of the sheer size of the Android ecosystem. 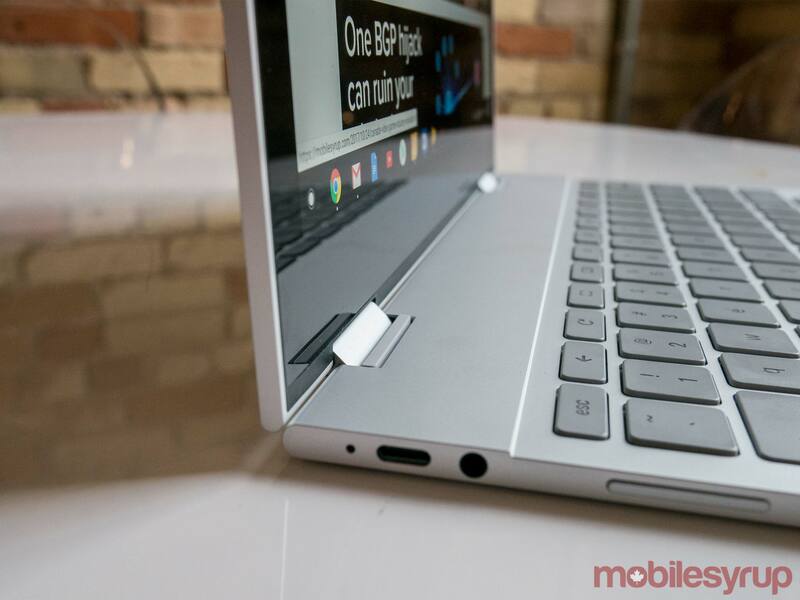 And even if it's not for you, one thing's for sure: it's a darn good Chromebook. "The Pixelbook makes a strong argument for the 'less is more' approach."